No Time To Read This? Recently, when we were baking something, the oven door spring gave out mid-use and came crashing down. Promptly, Trevor pulled apart the oven to access the broken door spring and repaired it. Thank goodness I’m married to MacGyver. I spent a half hour cleaning up this faithful stove (and the dust bunnies under it) and reflected on our culture’s penchant for NEWNESS. In our homes and workplaces, we emphasize the value of NEW. Old ways, old décor items, old clothes, old furniture are….well… just OLD. OLD “dates” a home and “ages” a person. OLD announces you can’t invest in NEW…the new car, the new oven, the new marketing technique. As I de-greased the knobs on my oven, I reflected on how broken this view of OLD really is. Because we’re discontent with OLD, we’ve demanded that our stuff keep up with our pace and we’ve become a throw-away society that keeps upgrading. I’ve had the same car since 1999. Seriously. It’s a small SUV and it is very comfortable. Once, in 2012, I had a fender bender and again this year – nothing that a little body work couldn’t fix. It has over 206k miles. And I’m in no hurry to replace it. I have no debt on it and it serves me well. Lots of people tell me that “it’s time.” I just don’t want to break up with it in its golden years. Upgrading our stuff is a constant cycle of out-with-the-old and in-with-the-new that not only chews through stuff and discards it; it takes time and energy to toss and up-level. We end up serving this cycle. It keeps us disparaging the past and what we DO have. It keeps us scouring the stores, catalogs, and online shops for newer, more interesting, more current belongings. We’ve collected our way into an appearance of how we see ourselves, and how we want others to see us. This compulsion to upgrade ranges from our stuff, to our marriages, to our jobs, to our friendships. We have DISassociated from what matters most and associated with an insatiable Need for New, Improved, Better, or just More. Everywhere we turn, our eye is tantalized and what we DO have loses mental value and what we DON’T have starts gnawing on us. In this consumer culture; we’ve over-associated with our belongings and under-associated with that which really matters. Now, we all know that “society” isn’t to blame, nor are the Instagramers who seem to have it all, and the latest. Our eye can only remind us of what our heart possesses or lacks. We may even find that we’re discontent in ALL these areas. And that – in fact – discontent has become a way of life for us. It’s a negative spin we feel about everything. Discontent begins within. Hearts that are discontent aren’t just unhappy with the stuff they have. They are unhappy period. They’re driven by a fear of lack, of not having what they want or need. They’ve experienced lack and they don’t ever want to experience it again….lack of freedom, lack of hope, lack of provision, lack of fulfillment. Hearts filled with lack are insatiable on the inside and striving on the outside. DIScontent literally means to be separated from substance. When we live in a state of discontent we are not able to see the substance – the rich and lovely content – of our lives. Discontent tears us away from that which rightfully belongs to us – and I don’t mean our stuff – I mean it robs us of our IDENTITY. Discontent robs us of remembering WHO we are. We forget that we’re a unique, limited edition sent into this world full of gifts that this world needs. A Bully Spirit starts degrading us instead. We begin picking at ourselves and since no internal self-improvement seems to be working, we set about improving our external world. Discontent robs us of our BLESSINGS, too. Through our negative mental state, we read everything critically. In fact, a Critical Spirit creates and fans discontent. It grouses continuously and issues demands. That critical mindframe moves outward from ourselves onward to our relationships, and to how we’re performing in our spirit, our health, our homes, and our work. And the Critical Spirit has no lack of fodder, so little hurts and thoughts and perceptions are fed each day with new negative “proof” and the chasm between us and intimacy, community, and happiness grows wider. When we lack contentment internally, we subconsciously work to correct that externally. We put our head down and resolve that we had better work harder or be better so we can fill this lack inside. We move into performance, striving, and acquisition. We try to get something on the outside that we cannot get on the inside. Now you can see why discontent is so destructive in our lives! Now you can perceive how layered and subtle this negative mindset is. And hopefully, you’re beginning to understand that – to live in freedom and purpose – we must identify and uproot discontent. Understanding the root cause behind anything is the first step to restoring order. The culprits of discontent, then – the hidden originators – are a spirit of lack, a bully spirit, and a critical spirit. No wonder we sometimes feel like we’re in a boxing ring of negativity! If one isn’t pounding on us, another is waiting to! It’s hard to get out of this ring alive and start fresh because we’re such good targets. Now one thing I want you to notice: for this much collusion of darkness to be going on, your contentment must be pretty key to you experiencing the abundant life!! Most people just think they can just go and create “success” and be happy. But with all this junk operating on the inside, they are tethered to discontent, usually permanently. Success and happiness elude. And what a sorrow to incorrectly perceive ourselves and our lives as insufficient! We just reviewed the culprits of discontent. And now we understand the goal of discontent: to convince us that we and our lives are insufficient and lacking. But, if the pain of living with negativity is becoming intolerable, we have another choice. It’s simple. It’s not easy, but it’s simple. We can step out of the ring of discontent. We reject discontent and all its henchmen and we deem them UNWANTED and EVICTED. We choose to break our agreement with lack, bullies, and criticism. We choose to TAKE BACK our identity and our blessings. We choose to take back the life we’ve yielded to discontent. When we REgard ourselves – and all we are and have – with esteem, we can turn the tables on discontent. To regard something is to judge, deem, estimate, assess, reckon, rate, or gauge it. Regarding with esteem and honor is the antidote to discontent. Begin by regarding YOURSELF afresh. Make a list of everything good about yourself, from your character to your nature, to your gifts, talents, and strengths. Behold – maybe for the first time – how awesome you are. Now you will begin to understand why darkness has tried to keep you bound up in discontent all this time….because as long as you’re distracted with negativity you can never fulfill your potential. Then regard your LIFE afresh. Make a separate list for your relationships, your household, your health, your work, and your spirit. Only list the positives in each of these areas, that which you possess and are grateful for. Post these lists where you can see them – this will enhance and enlarge your new practice of REgarding with esteem. Now begins the rewriting process. Each day look at your lists. As many times as you need to. Read aloud to yourself the Truth of who you are and what your life is really made of. Speak (to the mirror if necessary) all your powerful, wonderful, delightful ways and resources. Literally say aloud “I am a caring person and the world needs that” if “caring” is listed on your personal attributes list. Declare to yourself (and your dog, if he’s the only one around) “My health has improved in recent years, and I’m strong and flexible. My marriage is committed and steady. My job gives me the chance to do analysis and I’m good at that.” Whatever is GOOD, whatever is noble, whatever is true, whatever is praiseworthy – focus on these things and speak them out. Verbally speaking out loud all the good stuff about you and your life is a process that instructs your own mind. It’s a necessary retraining when you’ve been in a lifelong cycle of negativity. We’ve all heard we should practice gratitude, but frankly, we may not always feel so “thankful.” That’s because the culprits of discontent are still in operation in our lives and we’re trying to insert a cheerful thought into their presence. That is impossible. First, kick out lack, bullies, and criticism, and step out of the ring. CREATE CONTENTMENT by regarding yourself and the substance of your life with honor. Remembering and valuing WHO you are, WHY you’re here, and WHAT you already have are keys to a life of contentment. When you take this seriously, and verbally, emphatically put an end to the negativity, a new atmosphere will miraculously will open up before you. In this atmosphere, your statements of esteem and positivity won’t be swallowed up. Your positive regard for yourself and every dimension of your life will begin to grow as you create it. Every statement, every thought, will be a brick that you add to form a new, healthy foundation. Every time you add a brick, you’re strengthening your foundation. Conversely, every time you allow the old patterns and thoughts back in, a bulldozer comes through to tear up that foundation. Considering you don’t want to end up back in the ring being pummeled with discontent, tend your foundation carefully, removing weeds, taking mental pictures of your progress, and celebrating how far you’ve come. You know, life patterns can be very challenging to change. And most folks don’t. But YOU aren’t like most. You read REstore because you want an empowered mindset and life. If you – or those close to you – have struggled with pervasive discontent as a lifestyle, you know how imprisoning it can be. You alone have the power to exit this negative cycle of discontent with the power of your own will, mouth, and mindset. 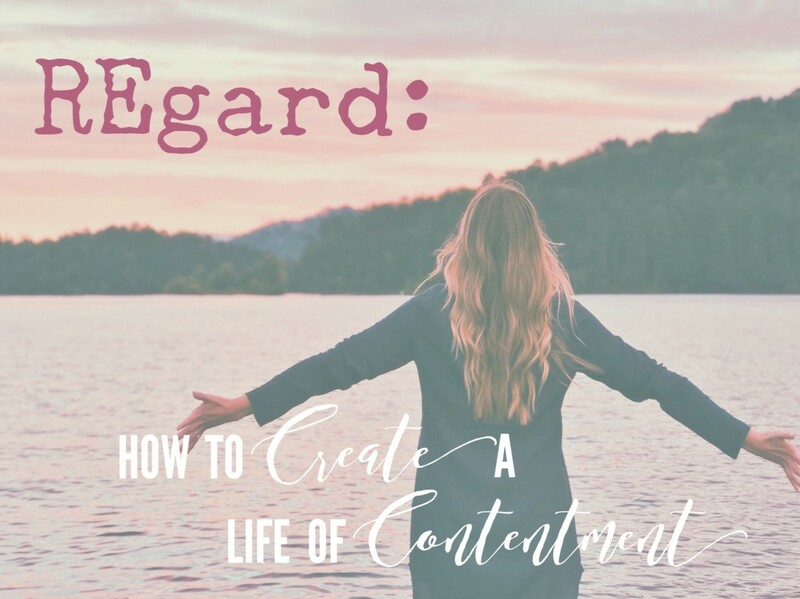 You can create contentment by regarding, literally noticing and valuing, the wonder and beauty of who you are and what you have. We can go through life tearing down ourselves and the fabric of our lives, or we can go about building it up. It all depends on HOW we deem, assess, and gauge. Rid of darkened thinking, we are free to regard ourselves and each area of our lives from a position of strength and honor. What we feed grows and what we starve withers. Feed upon praise for your life, and contentment will grow inside of you. May each of us Life Reclaimists choose victory over discontent, exercise our power to create new realities, and experience a life of deep contentment; which is quite possibly the rarest treasure of modern living. As always, just what I needed to hear right when I needed it. Thank you so much! Thank you, Alesia! It is always good to hear from you! So glad we can keep you inspired! Keep in touch!